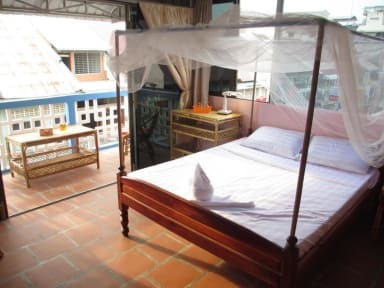 There are several kinds of rooms available in the guesthouse, single, double, family and dorm, meeting your different need. All rooms have good comfortable mattresses. Free WiFi covers the area of guesthouse. Security are provided for 24 hours, providing you with convenience and safety when staying with us. bicycle and motor bike rental.Visa service! good place for backpacker! nice family running. good bar and restaurant. every helpful and understandable from my difficulty. Really nice hostel. The staff are so friendly and helpful, the beds are comfortable and there is warm water. Located right in the center of town. good stayed. best location and atmosphere. good place for backpacker. Cheap and comfortable. Sødeste værtinde!!!! Meget informativ og hjælpsom. God atmosfære med mange fællesaktiviteter. God mad. Varmt på sovesalen og umiddelbart direkte afgang dertil fra gaden, så vi ved ikke helt med sikkerheden, selvom man godt nok skal igennem fællesareal, reception og mellemgang for at komme til sovesalen. Ingen mulighed for storage af bagage, så det tager lidt af gulvpladsen. Bad/toilet ikke hundrede procent rent, og høj musik til kl. ca. 2 om natten er eneste minus. Dog bestemt et besøg hver!! Good, quiet location and a nice outdoor sitting area in front where you can order drinks and food. 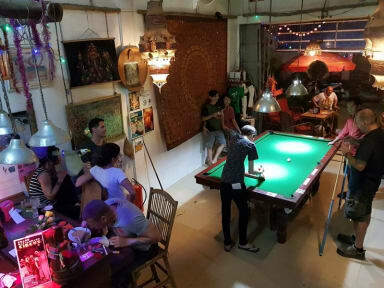 The bar wasn't really my thing, but if you're looking for a party and a game of pool, this is for you. The bathrooms on the 1st floor are basic and could've been cleaner, but were still okay by Cambodian standards. And I liked the 1st floor dorm. Fans only, so it can get sweaty. But it's large, has four-poster beds and the old-fashioned look of a colonial-era hospital. I found it atmospheric. I guess it’s considered a guesthouse so it can’t really be viewed as a hostel, but it’s definitely not a place for a solo traveler. A lot of the expat community from the town hang out there which can make you as a paying costumer feel valued second. It is in a great location and the food was delicious. Not a bad choice as Battambang doesn’t really have many options. Although the staff were very friendly, I felt the atmosphere of the whole place was very depressing. The owner was grumpy and non-communicative as if he did not really care that I was there at all. Also on Wednesday lots of ex-pats come to the guesthouse for drinks and although I tried to engauge in conversation, I found that they also were very exclusive therefore making my stay at Ganesha family guest house very non-family. The rooms were extremely hot with minimal fans. Worst hostel I have stayed in by far!!!! Cockroaches everywhere, very dirty bathrooms and from peeking into what looks like the kitchen I would not eat here for sure. When I asked to leave after my first night (booked 3) because of the conditions I was told by 2 very rude staff that it’s my fault I’m leaving and would not get any money back. Eventually managed to get $2 which isn’t even the price of 1 nights stay. Not too sure why other people have rated this place well. I couldn’t see any good.